It was a beautiful morning in Donaueschingen, Germany. The sky was clear blue, with high clouds far out on the horizon. The air was crisp and a light fog hung close to the ground. We knew it would burn off quickly and would be a great day to fly. But the weather forecast did not agree with our plans to fly to the north coast of Europe. The central part of Germany was blocked with heavy rain and low ceilings. This place is really small (only 400,000 people in the country), old (over 1000 years), and really kinda boring. A good place to go to read a book. Maybe it's just because it's a Monday night, but all the shops closed around 6pm, and that left the streets empty. Except for Abi (or Abby, or whatever, she really doesn't care how you spell her name!). I met Abi as Mattias and I were walking down one of the deserted streets of Luxembourg. She was dressed in a tutu, ballet slippers, and leg warmers, and was juggling a few colored balls... in the middle of the intersection! There was a crowd of exactly NOBODY gathered around to watch her act. But it wasn't because she didn't try. This girl is completely zany. She even ran up to a bald-headed man walking down the street and kissed him smack on the top of his head, leaving a perfect set of lip-tracks for all the world, except him, to see. She danced all around, juggled, did all kinds of tricks and talked to passers-by in several languages. I was entranced, but it seemed as if the Luxoids were comatose. I wanted to take a photo of her juggling a torch, but she couldn't get it lit, even with the help of two different lighters offered by tourists. Some days it just doesn't pay to get out of bed, but you don't know that until after you get up! Poor Abi couldn't buy a crowd in Luxembourg. But she has a great heart, you can just tell. Here's a photo. Note the complete lack of audience in the background. She is from Australia and is touring Europe with her husband David who is also a street performer, among other talents. You can learn more about him by visiting his web site at http://www.stickyplanet.com.au but be warned it is heavily graphics dependent, so it may take some download time to see it all fully. Now if a street performer has a web site, why don't you? 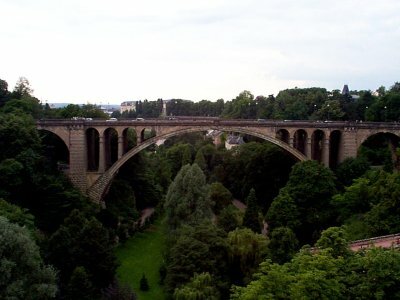 Luxembourg prides itself on its bridges and parks. Tomorrow the weather should be good enough to fly to the coast. We haven't yet decided which way we will go, left toward the English Channel, or right toward Belgium, Neterlands and Denmark. Maybe the weather will decide for us. I am hatching a scheme to invite the Prince and Princess of Luxembourg to come for rides in our biplanes tomorrow morning. I think they need it. Might add a little zest to things around here.